Today is Wednesday, April 10th, 2019. I’m Kevin Boyle, with today’s W-V-B-I Community Calendar. Talking Threads Quilt Guild Wednesday this morning and every Wednesday morning at 9:30 at Peaine Township Hall. Tomorrow, Pickleball at the BIC Center from 9:30 to 11:30. Euchre tomorrow evening at Stoney at 7. Arthritis Foundation Exercise Program from 10 to 11 Friday up in Carol’s Hangout here at the BIC Center. And, B-I Fit is all week over at the school. Sign up if you haven’t already in the school office. Lego Club Saturday at the Library at 1. Self defense class at Peaine Township hall at 5. Also Saturday, two great feature films at the BIC Center: Bumblebee is at 4, rated P-G 13. And at 7, it’s The Mule staring and directed by Clint Eastwood. It’s critically acclaimed. Rated R. Both movies on the big screen with the big sound in the McDonough’s Market Theater. Concession stand will be open for both movies. Popcorn, pretzels, sweets, Nathan’s hotdogs with chips and pop from the soda fountain. Here’s something to put on your calendar. The A-P English class at B-I-C-S is studying Shakespeare and planning a trip to England to visit the Globe Theater, where many of his plays were first performed. To raise money for it, they are planning a dinner fundraiser. It’s spaghetti—all you can eat—on April 23rd from 5:30 to 7. Your free-will donation will help support their trip. Weather, here there and everywhere – presented every day with the support of the good folks down at McDonough’s Market: Today Mostly sunny, with a high near 39. Northeast wind around 10 mph. Tonight A 10 percent chance of snow after 5am. Increasing clouds, with a low around 28. Breezy, with a northeast wind 15 to 20 mph, with gusts as high as 30 mph. Thursday Snow and sleet likely before 4pm, then snow and sleet likely, possibly mixed with rain and freezing rain between 4pm and 5pm, then rain and snow likely, possibly mixed with freezing rain after 5pm. Cloudy, with a high near 33. Breezy, with an east wind 20 to 25 mph, with gusts as high as 35 mph. Chance of precipitation is 70%. Little or no ice accumulation expected. New snow and sleet accumulation of around an inch possible. Thursday Night Sleet, possibly mixed with freezing rain before 9pm, then rain, possibly mixed with sleet between 9pm and 10pm, then rain after 10pm. Low around 31. Windy, with an east wind 20 to 30 mph, with gusts as high as 45 mph. Chance of precipitation is 90%. New sleet accumulation of less than a half inch possible. Friday Rain likely before 2pm. Mostly cloudy, with a high near 46. Breezy, with an east wind 15 to 20 mph becoming southwest in the afternoon. Winds could gust as high as 30 mph. Chance of precipitation is 60%. Friday Night Mostly cloudy, with a low around 34. Breezy. TRAFFIC: No delays inbound or outbound to the airports, beltway running smoothly. Roads are drying out after the thaw and the rain, but there are plenty of hazards lurking out there. Ruts, boggy spots, ponding—even some lingering ice and snow. So let’s be careful out there. Especially in the school zone. Time now for a look at Phyllis’s Facebook posts… ON THIS DATE in 1970 Paul McCartney announces the breakup of the Beatles. The legendary rock band the Beatles spent the better part of three years breaking up in the late 1960s, and even longer than that hashing out who did what and why. And by the spring of 1970, there was little more than a tangled set of business relationships keeping the group together. Each of the Beatles was pursuing his musical interests outside of the band, and there were no plans in place to record together as a group. But as far as the public knew, this was just a temporary state of affairs. That all changed on April 10, 1970, when an ambiguous Paul McCartney “self-interview” was seized upon by the international media as an official announcement of a Beatles breakup. By year’s end, Paul would file suit to dissolve the Beatles’ business partnership, a formal process that would eventually make official the unofficial breakup he announced on this day in 1970. WORD OF THE DAY: flimflam (FLIM-flam) which means to trick, deceive, swindle, or cheat. Flimflam “to trick, deceive, swindle,” shows the same common vowel alteration in a reduplicated word as in mish-mash or pitter-patter. Flimflam may possibly be based on a Scandinavian word, e.g., Old Norse flim “a lampoon, mockery.” Flimflam entered English in the 16th century as a noun meaning “idle talk, nonsense; a cheap deception.” The verb sense “to cheat, swindle,” originally an Americanism, arose in the late 19th century. Birthdays: Liam Hodgson and Olya Stebbins. Happy Birthday to Olya and Liam, and if we missed you on the list—Happy Birthday to you, too, from all of us at W-V-B-I and Beaver Island Community Center. Don’t forget about the PABI Ice Classic going on right now. The buoy seems to be holding its own for the moment, but its own a shrinking island of ice. 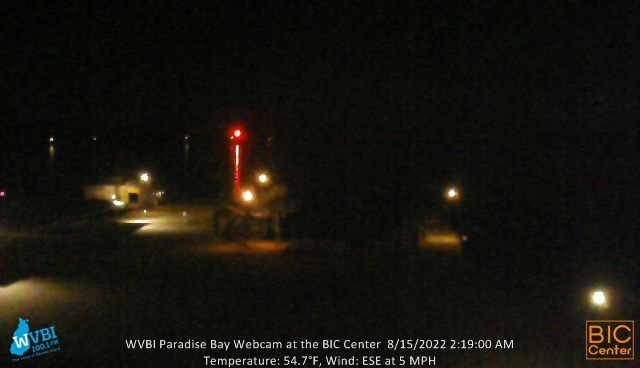 Check it out yourself on the WVBI Powers hardware webcam from high atop the BIC Center. It’s at the bottom of our web site. If you enter the PABi Ice Classic and make the best prediction of when the buoy goes through the ice—you’ll take home half the entry fees—other half goes to support your community radio station and your community Center. You can buy your entry here at the BIC Center. Details and rules are available at bic center dot org. Just click the Ice Classic menu at the top. I know this DJ who is obsessive compulsive about his 45s. He owns every single Beatles single on 45 except for one. I think he needs Help. That’s the W-V-B-I Community Calendar for Wednesday, April 10th, 2019.